Need more information? Talk to __Anytown_Toyota__ today. 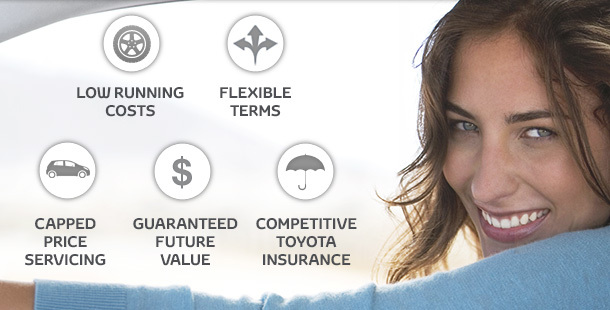 Toyota Access is an easy and flexible way to put you in complete control when you're buying a new car. We will calculate the minimum Guaranteed Future Value of your vehicle so you'll have the reassurance of knowing what lies ahead. And, because Toyota Access comes with low monthly repayments and a short loan period, you can upgrade to any New Toyota without worry or hassle[T16]. Simply pay the outstanding balance (including the final payment). We can help you refinance the balance if you don't have the cash on hand (conditions apply). We'll pay you the GFV we agreed at the start of your term and put it against the remaining balance owing on your account (subject to Fair Wear and Tear conditions and agreed kilometres being met). Don’t hesitate, contact __Anytown_Toyota__ today for your brand new Toyota!